If you have problems when playing (1080p/720p) MKV video on Surface Tablet, you can follow this way to convert MKV to MP4 videos for Microsoft Surface 2, Surface Pro 2, Surface RT and Pro. Both Microsoft’s Surface for Windows RT Tablet and Surface for Windows 8 Pro Tablet feature a large 10.6-inch HD screen which is definitely perfect for watching videos on the go. However, due to format limitation, sometimes you’ll find you can not play MKV files properly or missing audio when playing MKV videos on your Surface Tablet. Besides, there are lots of other formats (VOB, TiVo, MPG, etc.) that Surface does not support. Then what if you want to enjoy MKV videos on your Surface tablet effortlessly? Get frustrated? Here you’ll find the best explanation and solution. MKV stands for MatrosKa Video. It is a very popular file format for High Definition video. Meanwhile, MKV is an open standard free container format, a file format can hold an unlimited number of video, audio, picture, or subtitle tracks in one file. The reason you cannot successfully get some MKV videos playable on your Surface is quite simple: the default and downloaded player on the Microsoft Surface Tablet cannot find a suitable decoder for the codec in the MKV file. So you will meet problems such as audio and video out of sync, video without sound, or even can’t be played. As far as I know, an easy way to solve these problems is to convert MKV to something Surface 2, Surface Pro 2, Surface RT/Pro can recognize. Along with some help from third-party software , you can finish you task effortlessly. Below I will take Pavtube Video Converter Ultimate for an example to show you how to transfer MKV videos to Microsoft Surface for smoothly playback. 1. Install and launch the Video Converter Ultimate on your Computer, click “Load from disc” to import your videos. mkv format. Besides MKV, you can also load FLV, AVI, WMV, VOB, TiVo, MPG, MOV, etc. files to the program. The software supports batch conversion so that you can also add several files to convert at one time. 2. Click “Format” bar, follow “Windows > Microsoft Surface Windows RT/Pro H.264 Video (*.mp4)”. The output videos could fit on Surface 2/Pro 2/RT /Pro perfectly. If you like, you can click “Settings” to change the video encoder, resolution, frame rate, etc. as you wish. 3. 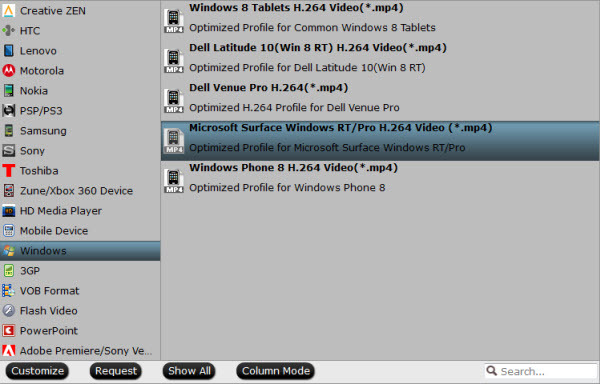 Start the conversion from MKV to MP4 video for Microsoft Surface. Note: By Clicking”Settings”, you will open a “profile settings” window. 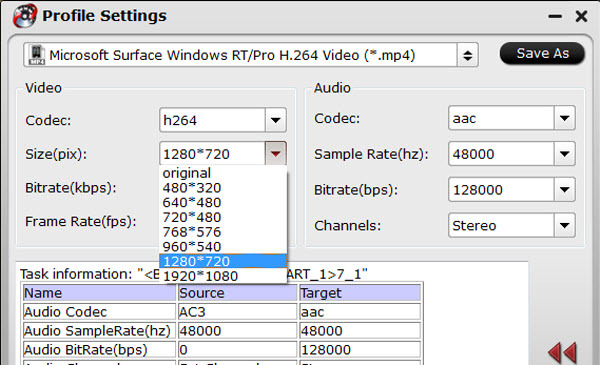 As follows, you can adjust some parameters to get the video quality you want. But you should know, higher quality with bigger size, Please pay attention to the storage space of your Microsoft Surface. 4. After the process, transfer the videos to your Surface Tablet. If you have no idea about Surface file transfer, check out a guide here. So there you have it. Pretty simple! In this way, you can effortlessly play 1080p/720p MKV videos on Surface 2, Surface Pro 2, Microsoft Windows RT and Windows 8 Pro Tablet as you like.